We got Grayson's new bookshelf today! It's a fun sling-type one that's just the perfect size for him! 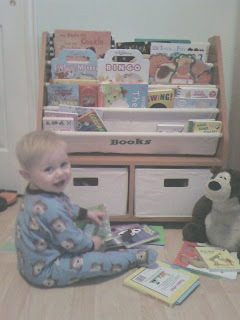 He LOVES books, and he spent allllllll day today taking all his books out one by one and looking at them all! I'm so glad we got it for him! Thanks to eveyone who gave Gray money for his b-day -- this is what it bought!!! :D He loves it! 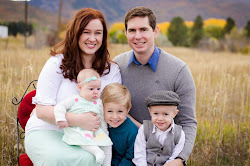 OOooo, that's super cute!! Where did you get it? I really like the storage bins on the bottom too. what an awesome gift ! 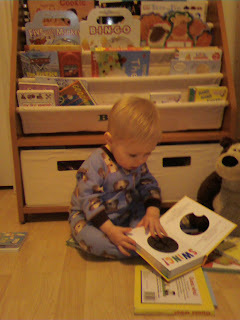 I love the pictures too - he is always so intent when you read to him. 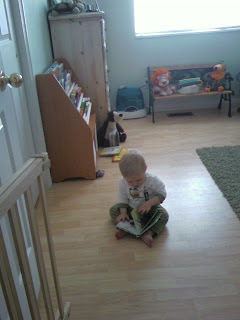 I love that the books are so easily accessible for him - - great idea !